Vengeur Masque commences his Caulfield and Melbourne Cup campaign at Caulfield on Saturday where he is one of three runners for the stable. Vengeur Masque (pictured) runs in race five, the Heatherlie Stakes over 1700m with Patrick Moloney to ride from barrier three. Mike Moroney deliberately gave the import a light autumn of just two races to prepare him properly for a Cups campaign. “He looks terrific, he’s carrying a bit more condition and is stronger,” Moroney said. 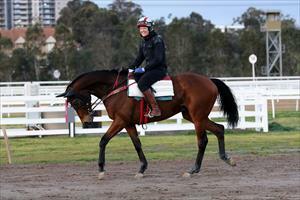 “He’s had a couple of jumpouts and I’m really happy with the way he’s going. “He’s drawn ideally in barrier one but we will likely drop in behind them as we’d like to teach him to relax a bit more and he’s been showing us that at home. Lord Barrington is our first to go in race two, the Nitto Denko Handicap over 1200m with bar plates added and Patrick Moloney. The seven-year-old finished unplaced at his last start over 1100m at Caulfield on August 18 with Stephanie Thornton claiming. “He’s drawn nicely in barrier two and we’ve elected to go with a senior rider again and put Patrick back on,” Moroney said. “He’s still got some little issues with his feet and we’ve done a lot of swimming with him. The good track means we’ll put bar plates on him and they will help him. Radipole resumes in race four, the Jockey Celebration Day Handicap over 1400m with James Winks to ride and jumping from barrier 12 in a field of 13. The import is racing for the first time since finishing unplaced in the Group JRA Plate at Randwick in April. “I doubt there will be enough rain to affect the track for him which would help but the biggest issue is the draw,” Moroney said. “It’s disappointing as it does look a winnable race so we’ll just have to probably go back and ride for luck. “If the race pans out and they go hard in front then he could be getting home over the top of them but if it is slowly run then the backmarkers will not have much hope.